Guiherme Carvalho: A reta é um espaco métrico completo (2003). As more contemporary composers explore the unique character of the accordion, the broader its context as a concert instrument and the less stereotyped it's image. 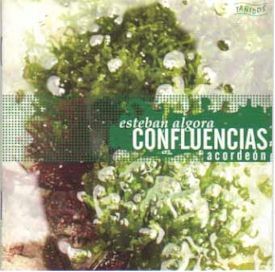 This wonderful recording by Spanish accordionist Esteban Algora, serves to celebrate the accordion as a producer of a sonic world completely devoid of the usual nostalgic trappings of the repertoire. It is a fiercely experimental album and not for those seeking comfort or familiarity but is instead an intense and carefully executed program of avant-garde works by Spanish composers. The disc commences with two haunting pieces from a chamber opera by Josê Ma Sánchez Verdú and features the soprano voice of Saioa López. Uninhabited Bodies and Shadows Dance both use breath, harmonics and charged incantation-like repeated figures with rattles and other non-pitched sounds. The result is hypnotic and highly theatrical. The title piece Confluences by Alfonso Casanova explores the extreme ends of the accordion's range. It's an intense ride as high shrill and low growling passages intersect and collide showering the ears with aural sparks. The only equilibrium that arises is a unison pitch (an F#) which culminates the work. A radiant lightness pervades Enrique Igoa's Torcal for accordion and guitar. It's the most obviously Spanish on this disk which occasional echoes of Flamenco on the guitar. The precise and playful give and take between instruments propels this piece along through a variety of moods and recurring melodic fragments. The title refers to a geological erosion of limestone rock. Dhamar is an astonishing duet between accordion and saxophone and is the third included piece by gifted composer Josê Ma Sánchez Verdú. Unlike the previous duet, the two instruments here merge into each other, forming some other sonic creature, it's character slowly unfolding in always surprising ways. Often, the sax playing multiphonics acts as an aura around the accordion's shimmering tremolos or sustained basses. Both seem to return to a kind of primal source. Breathing and non-pitched sounds are used artfully and with expressive care. The Last Potion for accordion and tape by Eduardo Polonio begins with an epileptic accordion solo against a soft background of electronic sounds. Then the piece settles into a meditative stretch of very quiet signaling. Suggests a kind of extraterrestrial communication exercise. Alberto Posadas' Snefru is another one for accordion and electronics albeit on a grander scale. The composer describes using mathematics evidenced in the design of the Egyptian pyramids and applying it to the sound materials. Fascinating textures result. The exploration of micro-intervals in the electronic part is especially impressive. Though I can't attest to it's mathematical construction, as a compelling sound experience it very much succeeds. In Secuencia XIII Andrés Lewin-Richter presents a more melodic accordion part over a watery, shimmering, ever flowing electronic part. Often the melodic material sticks to regular rhythmic values as opposed to the liquid electronic presence. At other times the electronics mimic passages on the accordion and vice versa. The piece certainly has an abundance of ideas. The final track's title translates as The line is a complete metric space. Guilherme Carvalho's piece is for accordion, clarinet, cello, flute and percussion and explores varieties of musical density. It's a somewhat austere listen, mostly redeemed by the excellent musicianship of the delivery. Recorded live at a concert in Paris. The recording quality is generally good except for the live final track with has some digital distortion in the loud sections. The booklet is informative and gives impressive bios of the composers. With this audio document, Esteban Algora joins the growing ranks of virtuoso players expanding the sound world of the accordion and it's repertoire.